When Annie was a senior in high school, her high school economics teacher encouraged her to read the book Rich Dad, Poor Dad. That book enlightened her to the concept of compounding interest, which changed the course of her career interests. She decided that being a financial advisor was the right path because of her strong desire to help others reach their financial goals. Now, Annie speaks twice a year to that same high school teacher’s classroom on investing concepts. 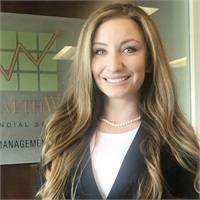 Annie Naghavi joined as a financial advisor with WealthWise Financial Services in 2019 after spending seven years as an advisor at Ameriprise Financial. She graduated from California State University, Fullerton, where she earned her Bachelor of Arts in Business Administration with a concentration in Finance. Ms. Naghavi currently holds her FINRA Series 7, Series 66, and Life & Health Insurance License with the state of California. She also holds the designation of Chartered Retirement Planning Counselor (CRPC). In addition, she is in the process of obtaining her Certified Financial Planner (CFP) designation as well as a Master’s Degree in Financial Planning. Born and raised in Orange County, Annie enjoys all things southern California has to offer. In her spare time, she enjoys running in half marathons, volunteering with the Youth Motivation Task Force as well as the Alpha Delta Pi sorority, traveling the world with her husband, cooking, hiking, and practicing yoga. Also, her Chihuahua rescue dog named Bijou brings joy to her life.